Over the years, I’ve enjoyed the pleasures of annual short story anthologies, particularly New Stories From the South, The O. Henry Award Stories and The Best American Short Stories, each of which showcases some of the best American short fiction printed during the previous year. To that list, I’m happy to add The Journey Prize Stories, of which I only recently became aware. 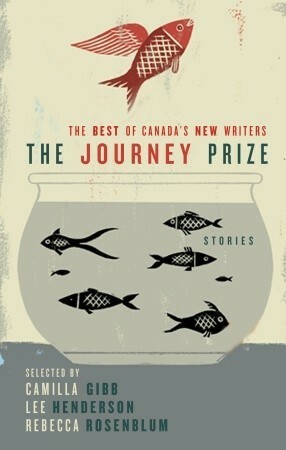 The Journey Prize is awarded annually to the best short story published by a Canadian writer and is sponsored jointly by the Writers’ Trust of Canada and the publisher McClelland & Stewart. While the $10,000 cash prize that accompanies the Prize is not insignificant, more important is the critical recognition bestowed on the winning writer. Prior to the announcement of the winning story, the finalists are collected into an annual volume entitled The Journey Prize Stories, with the 21st volume having been released this past October. The twelve stories that make up the most recent collection are truly quite good. While several of the stories share the element of a central character being afflicted with illness, overall, these tales are a diverse lot and most readers will surely find something of interest among this dozen. Below are brief summaries of each (with the respective author’s name noted in parentheses). “Lure” (Adrian Michael Kelly): Explores the intricate relationship between a young boy and his father against the backdrop of their first fishing trip together. “Away” (Lynn Kutsukake): Poignant tale of a young girl who went missing and the impact of the revelation many years later that the girl had not run away as had originally been thought but was abducted. “Easy Living” (Jesus Hardwell): Reflection on life’s daily struggles as told through the mundane conversations among the denizens of a local bar. “Highlife” (Paul Headrick): A wife deals with the distance that develops between her and her music critic husband following his diagnosis of a terminal illness as she struggles to emotionally support him as he pursues his musical passions and ignores her. “The Wisdom of Solomon” (Dave Margoshes): Amusing reflections of a fictional newspaper advice columnist who spins one tangled web too many to his later chagrin. “Miracle Mile” (Alexander MacLeod): Insight into the mutual respect displayed by two friends, both dedicated track competitors, and the resulting emotional tension between them when one finally decides to hang up his running shoes. “Deaf” (Sarah L. Taggart): A young couple deal with the realities of their daughter’s diagnosis of being deaf. “Pyro” (Sarah Keevil): A woman wrestles with the consequences of her interest in pyromania and her conflicted feelings for two men. “On the Line” (Shawn Syms): Amidst the daily tedium of working in a meatpacking plant and just trying to get by, the story’s heroine has an epiphany that finally prompts her to radically change the direction of her life. “Picturing God’s Ocean” (Fran Kimmel): A couple take their seriously ill daughter to see the ocean as the husband wrestles with his disgust at the capriciousness of life while his wife clings to her religious faith. “The Last Great Works of Alvin Cale” (Daniel Griffin): Another father-son tale, this one about their estrangement in the face of the adult son’s affliction with cancer and the father’s candid recognition of his feelings of jealousy toward the son’s artistic talent and their complicated relationship with one another precipitated by a woman who served as an artistic muse for them both.